Proponents of the measure—including the Ku Klux Klan and the Federation of Patriotic Societies—believed that the measure was necessary to preserve and perpetuate a homogeneous American culture. Opponents argued that the measure not only violated constitutionally guaranteed property rights but also posed a threat to religious freedom and the ability of parents to educate their children in accordance with their faith and conscience. 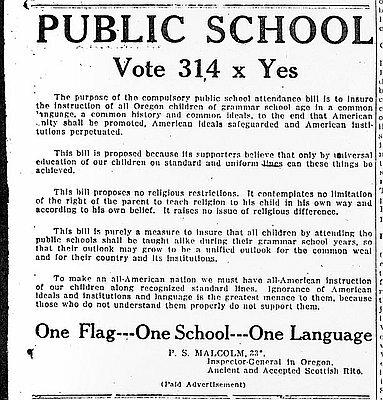 Those most opposed to the measure were Roman Catholics, the initiative’s main target, and Seventh-Day Adventists, Episcopalians, and Lutherans—religions that operated private schools. The Roman Catholic archbishop of Portland, Alexander Christie, immediately founded the Catholic Civic Rights Association of Oregon to combat the initiative and anti-Catholicism generally through pamphlets, newspaper articles, and lectures. In addition, the Oregon episcopacy asked pastors of the 130 Catholic parishes in Oregon to educate voters about the measure and to encourage Catholics to vote. Read more about the battle over the Compulsory Public School Attendance Bill in Pierce vs. Society of Sisters, by Robert Bunting. HS.2. Analyze the complexity and investigate causes and effects of significant events in world, U.S., and Oregon history. HS.10. Evaluate an historical source for point of view and historical context. HS.30. Analyze the roles and activities of political parties, interest groups and mass media and how they affect the beliefs and behaviors of local, state, and national constituencies. HS.58. Gather, analyze, use, and document information from various sources, distinguishing facts, opinions, inferences, biases, stereotypes, and persuasive appeals. 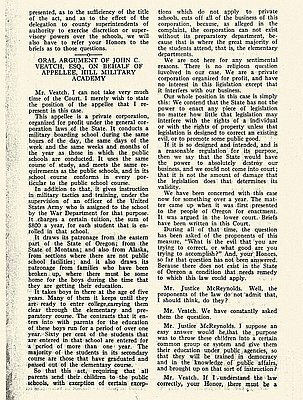 Have students read Pierce vs. Society of Sisters (1925) to understand the historical context of the Compulsory Education Act of 1922. 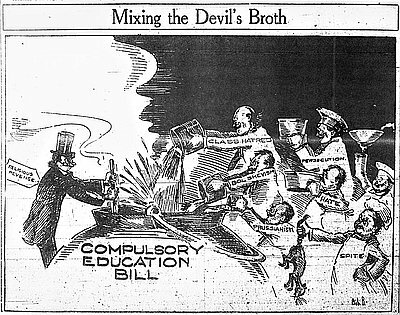 1) Have students read and analyze the "Devil's Broth" political cartoon from 1922 and the "Advertisement, Vote 314 x Yes" from 1922. According to the supporters of each document, what are the arguments for and against the Compulsory Education Act? (H.S. 60). Ask students how these documents use facts, opinion, stereotypes, and persuasion to argue their case (H.S. 58). 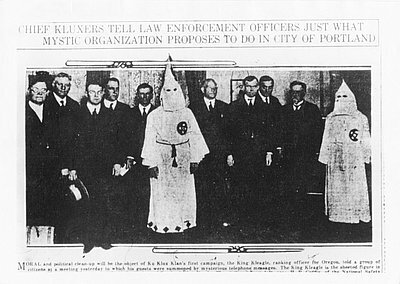 2) Have students analyze the following documents: KKK meets with Portland Leaders, 1921 photo; The Truth About the KKK , 1921 flyer; Portland KKK, 1922, photo. 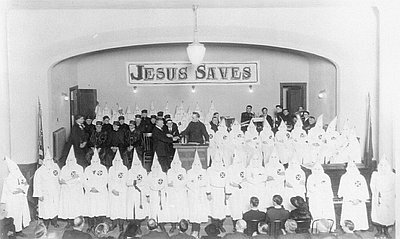 How did the Scottish Rite Masons and the KKK influence political, community, and religious leaders to support their political agenda and beliefs in Oregon? Provide specific examples (H.S.30). 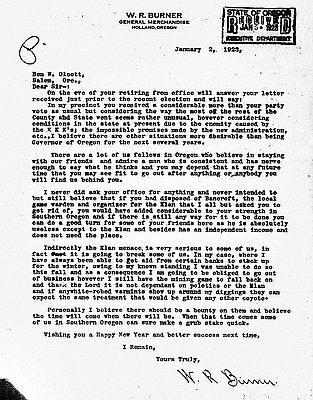 3) Have students analyze the following documents: Proclamation Against the KKK, 1922; From W.R. Burner to Governor Olcott, 1923; State of Oregon vs. Hill Military Academy, 1925. 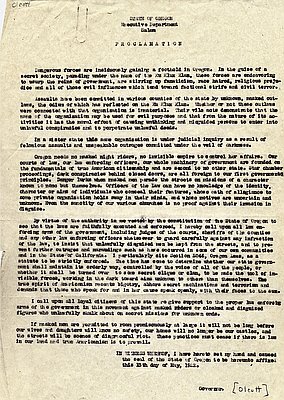 These documents represent the concerns political and judicial leaders had about the Ku Klux Klan and its plan to eliminate private schools. What arguments do they use to oppose the Compulsory Education Act? Abrams, Paula. Cross Purposes: Pierce v. Society of Sisters and the Struggle over Compulsory Public Education. Ann Arbor: The University of Michigan Press, 2009. Holsinger, M. Paul. "The Oregon School Bill Controversy." Pacific Historical Review 37:3 (Aug. 1968): 327-341.